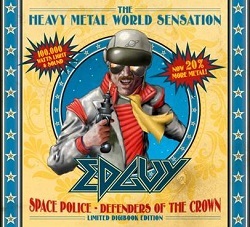 On April 18th EDGUY are going to release their new album »Space Police – Defenders Of The Crown« (“Their best album – nearly in a decade!”- Rock Hard Magazine). Today, the band releases the first track out of the record. Besides the regular CD edition the album will also be available as a limited digibook edition containing 2 CDs. Also available will be a strictly limited hardcover earbook collectors’ edition (28.5×28.5cm) containing the two discs, a photographic history with more than 130 photos from the band’s archive, liner-notes, touring history, etc.